The Ebac Triton Professional Dehumidifier is the ideal unit for commercial and residential work. Its compact size permits one-man operation, yet it has the capacity to handle several room-size areas at a time. Best of all, it's affordably priced within the budget of most restoration specialists. 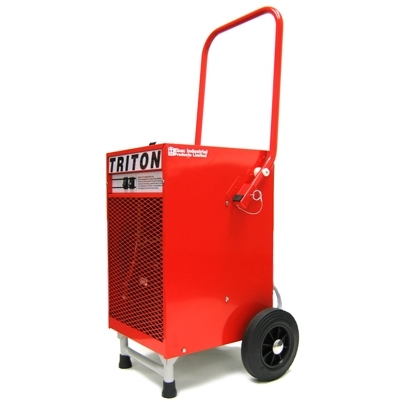 The Ebac Triton Dehumidifier is a rugged, yet mobile piece of equipment that will operate under extreme conditions and pull large amounts of moisture from the air. Ebac's "HOT GAS" defrosting feature which automatically eliminates frost build-up providing effective operation at low ambient temperatures. *Call 1-866-764-9900 to purchase options/accessories. IAQsource.com is one of the largest EBAC Dealers in the United States. We stock many of the EBAC products and accessories in our own facility providing you with a quicker turnaround time and instant tracking information on your order. We have installed EBAC units in a variety of applications and can offer expert advice on how to properly install yours. We are also an authorized service center for EBAC products and can offer warranty service and replacement parts. Whenever there is a need for fast, dependable, energy-efficient drying, Ebac and IAQsource.com can provide the solution. ***Note: Our shipping arrangement for the Santa Fe includes palletizing and shipping via an LTL freight carrier. There is a very high risk of damage when the unit is shipped via a small package carrier such as UPS. This shipping offer includes "to the curb" delivery. Freight carrier will call to set up a delivery window and someone must be present to sign for the delivery. Click here for more shipping details on this dehumidifier.